This page should give you a clearer idea of where each beach is in relation to each other and the neighboring area. You can also get a good idea of the layout of Byron Bay town centre itself from the top map. You can see a Map of Beaches Byron-Ballina here, to give you an idea of some of the great beaches lying between Byron Bay and Ballina. 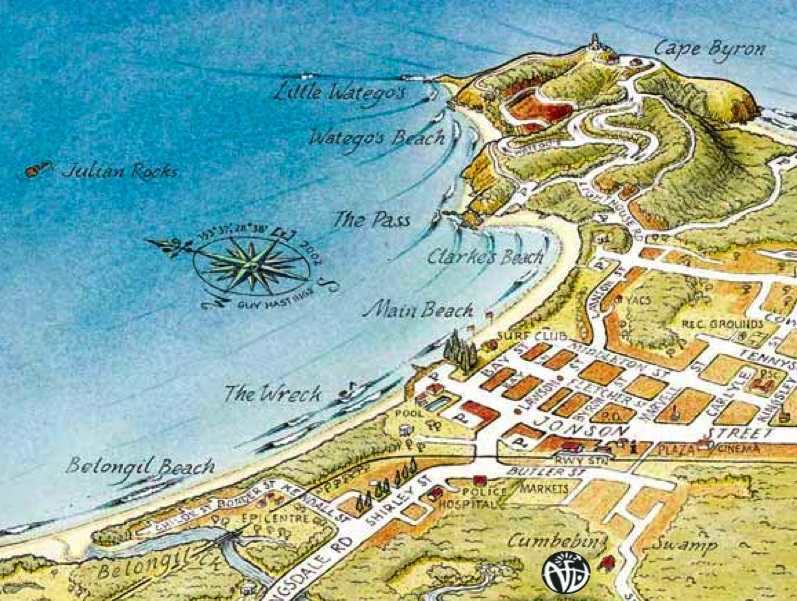 Another good Byron Bay Map - is supplied by byron-bay.com and comes in a downloadable PDF format which is easy to print and bring with you - very handy indeed. To download to your computer, right click here and choose 'Save Target As...' if you're using a PC - if you're using a mac just click on the link. Traveling north from Byron Bay, Belongil Beach stretches to the mouth of Belongil Creek and beyond, turning into Sunrise Beach then Tyagarah Beach - in all this is a 14 km stretch of unspoiled beach which goes all the way to Brunswick Heads. On the southern side of Cape Byron Headland - the most northerly end of Tallows Beach is Cosy Corner - to get there, follow the road signs towards the Lighthouse. Take the right-hand turnoff with a sign marked Tallows Beach - you can see the turnoff on the map above. There is a parking area from which it is a short walk to Cosy Corner - the only place to be when there is a northerly or north-easterly blowing. Continuing south to the end of Tallows Beach you come to Broken Head, which leads to Seven Mile Beach, then Lennox Head.